The following recipe is for three large breads. Ingredients that are underlined are critically important whereas the rest you can use at your own discretion. All quantities are approximate measures. The actual mixing of the dough and putting into trays takes less than two hours. But in between the dough needs to raise for several hours and the baking takes about 2.5-3 hours. Therefore I usually schedule a weekend and do large quantities which I then freeze. In a very large bowl (size of about 15 litre) mix sour dough, youghurt and ale with a whisk. Make sure there are no clumps left of the sour dough. Then add rye grains, linseeds and sunflower seeds and water and whisk it into a brownish soup. Then mix wholemeal and white flour into the bowl. You should still be able to use the whisk at this stage. Mix the rye flour into the dough with a big wooden spoon. Don't be shy to work yourself into a sweat and getting blisters in your palms. The dough should now have the consistency of a thick porridge. 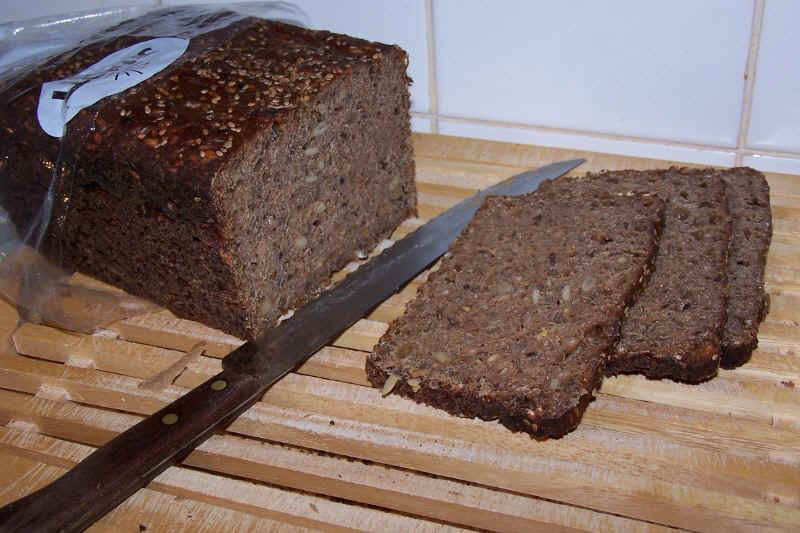 If using rye grains then it's better to err on the side of too wet than too dry. Otherwise the grains won't be able to swell up properly during raising and will then remain undigestable and will break your teeth when you eat the bread. Add more rye flour or water to achieve the right consistency. Don't even think about kneading the dough with your hands as it would then easily find it's way up under your armpits. Cover the bowl with a lid and let the dough raise in a warm place (like an airing cupboard) for 8-12 hours. 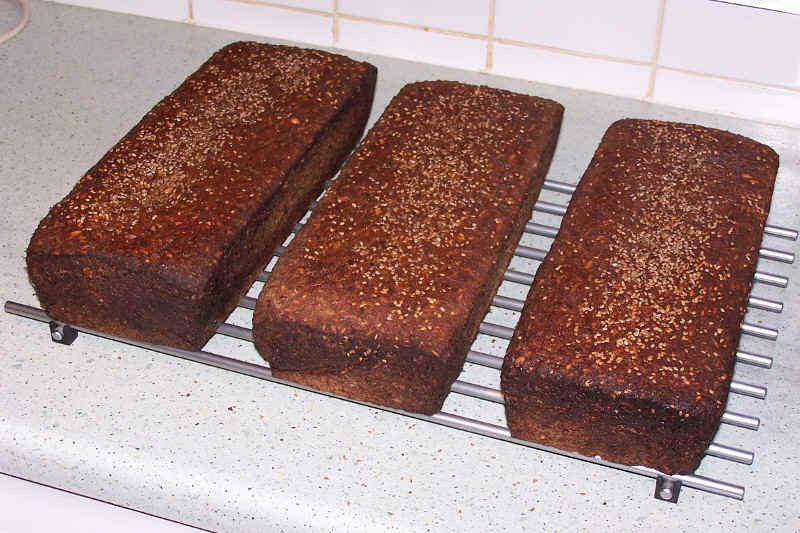 Rye grains must have had time to swell properly before baking. Unlike yeast dough, a sour dough doesn't double or triple in volume once it's raised. Unlike yeast dough a sour dough doesn't raise quickly. It will take several hours before there's a noticable change in volume. Once that happens, say after 9 hours, mix the syrup into the ale. Heat the ale luke warm if necessary to mix it properly. Then mix the liquid into the bowl with the dough. Mix for a few minutes to achieve a gooey texture. Now mix in the rye flour as to achieve a very though porridge, solid enough that a wodden spoon won't tip over if you ram it into the dough. This is when you put aside a clump of your dough that will serve as a sour dough batch for next time when you bake again. The three large baking tins I use have a volume each of about 4.5 litre. Grease them up with oil. Cover the bottoms of the tins with baking foil (not aluminium foil) to make life easy when getting the breads out after baking. Put the dough in the tins so they are a bit more than half filled. Even out the doughs in the tins with a flat spoon. Paint the surfaces with a thin layer of oil to preserve the humidity of the breads and to ensure the breads come out with a soft crust. Optionally sprinkle some sesame seed on afterwards for decoration. Cover the tins with alu foil and put them back into the warm place for the dough to raise another 15-20 hours. !! Paint the surfaces of the breads with vegetable oil to ensure their crusts turn out soft after baking. 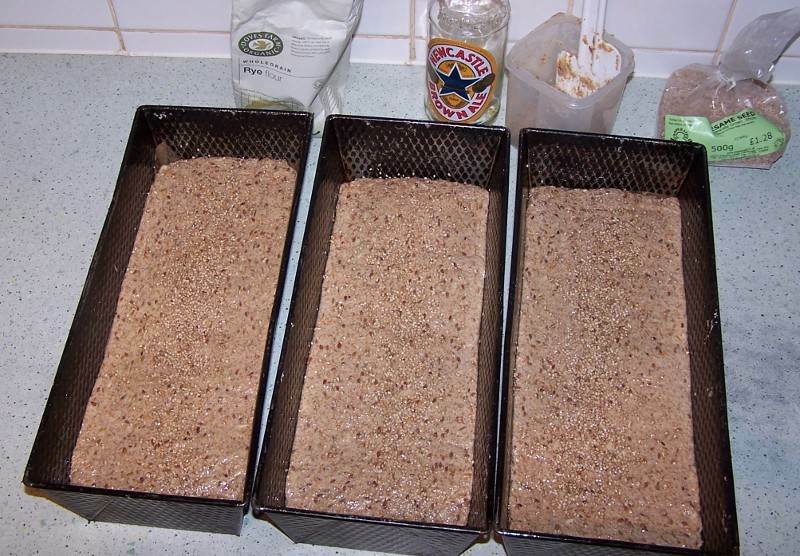 The dough should now have raised in the trays and be ready for baking. Bake the breads at 180º C for 2.5-3 hours. The breads are ready once the surfaces are not moist and you can stick a knife through the breads without any dough sticking on. You may have to remove the alu foils the last 20 minutes to achieve this. If in doubt about the temperature then it's better to err on the cold side and bake a little longer since it is easy to partly incinerate the ends of the breads if the oven is too hot, especially with breads as big as these ones. Loosen the hot breads from the tins by running a knife along the sides of the breads between the tins and the breads. Then very carefully take them out and place them on a grid iron so they can cool down and steam off. As long as the breads are steaming hot they are quite fragile and disintegrate easily so be very careful not to break them. Cover them with a cotton cloth for some hours until they are cold after which time they should be ready for eating. Put the breads in sealed plastic bags as to retain their moisture. Optionally you can freeze them now if you don't plan on eating them within a fortnight. To cultivate the batch of sour doug you got from your bread making leave it in a partly closed jar in your kitchen for 2-3 days. Stir it vigorously every 12-15 hours or so. It should continue to raise. You may want to add a little water to make sure it's not too dry. After 48 hours mix a level spoon of salt into it and put it in the coolest spot in your fridge ready for next time you bake. It should be usable for several weeks hibernating like that. Not to worry if it gets covered with a thin layer of fungus or smelly mould. Just scrape it off before using it. If you haven't got any sour dough to start off with you can boot strap one from buttermilk, youghurt, flour and a tiny bit of yeast. Dissolve the yeast in the buttermilk first. 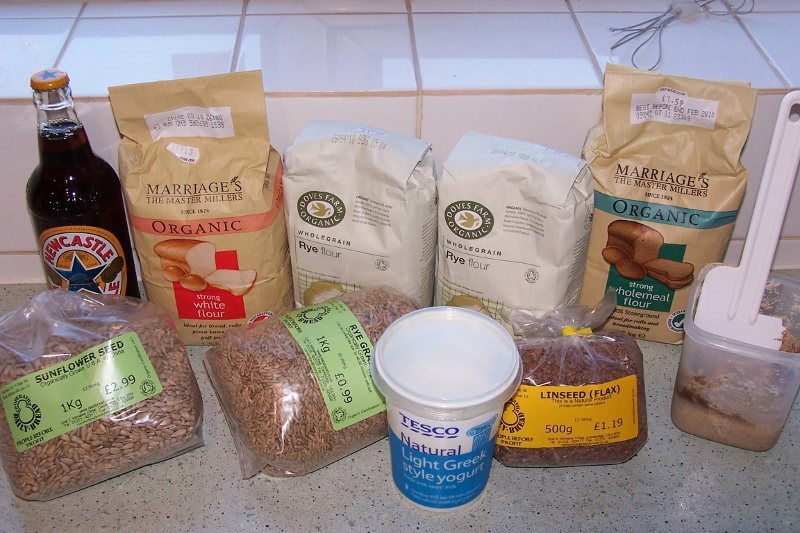 Then add youghurt and mix sufficient flour into it so as to get a thick porridge-like dough. Then treat the sour dough as in the previous paragraph and it should be ready for baking after 2-3 days. There's a lot of experimenting in doing all this and it does take some experience to bake breads with sour dough so don't despair if your first breads don't come out as expected.